Very Nice couch, Its lower but it worked for the area I needed. 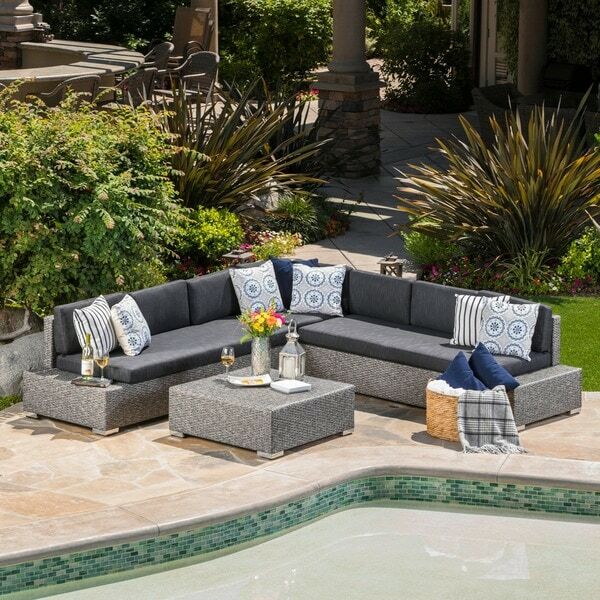 This Puerta, outdoor sectional sofa set by Christopher Knight Home can be arranged and rearranged in numerous ways, allowing you and your guests to enjoy the pleasant summer air without sacrificing comforts of your living room. 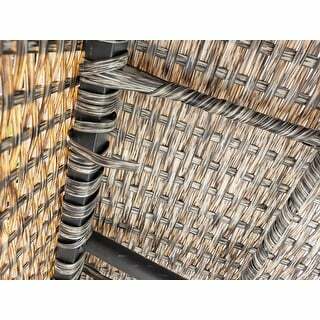 Made from weather-resistant fabric and top-quality wicker over a solid, aluminum structure, this sofa set will continue to provide value for years to come. This set is great. The quality is great (cushions could be a little more plush), but it was almost impossible to find a good set that was NOT brown and didnt cost an arm and a leg. It is fairly low, but that is part of the look. If you dont want modern, then don't buy this. We love it. Easy to put together, came in some BIG boxes, but was secured very well. In the picture, we are still in the process of finishing our patio, but it's what i could get for now. We don't have the pillows, etc. 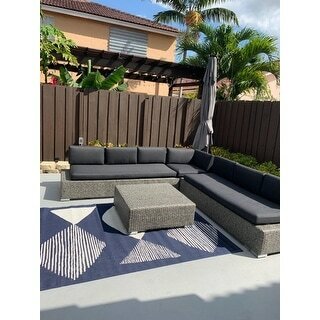 Nice outdoor sectional sofa. Firm and water resistant material. Looks really nice and expensive. We love it, makes our patio beautiful. We get a lot of compliments on it. This couch is great. I hope it lasts for years. It looks exactly like the pictures. Very easy to assemble. Corner and table come fully assembled. You just attach the feet to the long couches and the backrests to the bottoms. Everything came really nicely packaged in 3 large, but manageable boxes. Cushions were in plastic wrapping as was everything else with corner protectors. Shipped quickly, arrived quickly. It is comfortable to sit on and we especially like that the long couches have 1 long cushion and not 3 small ones. I love the style, however, it took a lot of time to assemble due to the fact that the washers and screws appeared to have just been thrown into the packaging. I had to jiggle the large seats to try to get all the washers out of which I was unsuccessful at even after 10 minutes of doing so. One side of the seating area, the holes didn’t match up to the backs so I had to use the other screws that were extra (long screws) from the other side of the seat to make sure they were somewhat connected (at an angle). Otherwise, the seating area is comfortable but you definitely need the cushions, without it, you’ll find yourself with an indentation on the wicker seating area itself. I love how comfortable this sectional is. It's nice and firm and the color is great. It was easy to put take. I would've gave it 5 stars but one sofa has a wicker that is loose and I'm scared with time it will unwind. I'll be keeping an eye on it. We bought an umbrella from overstock and my wife bought an outdoor area rug and now my small yard looks classy. 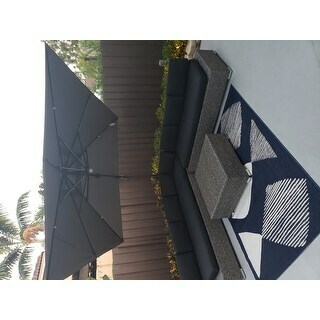 Love this outdoor set - great construction, super easy to assemble, and comfortable cushions. Plus, it's great to look at! 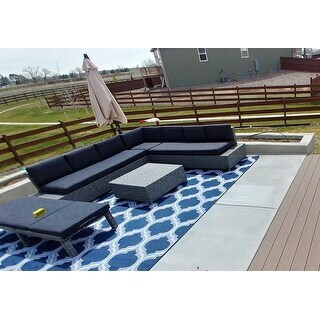 Purchased this set about a year ago for our new backyard deck. We set it up, did not get to enjoy it too much because the rain started. We were able to really enjoy it this summer and into Fall, and we just love it. Perfect for entertaining, and seats quite a few people. I love the gray dark gray cushions which will hide and spills or dirt that may happen over time. The price we paid for this set was not too shabby either. Very reasonable. Overall this sectional is really nice. I love the dark /light grey contrasts. For the most part it is really simple to put together, however, there tends to be an issue with the holes for the back and seat aligning when trying to attach the back part to the seat part. This is what took me the most time. Lastly, the slip guard sheets that come with it don't seem to stop the pillows from slipping. I will probably just by some Velcro strips and attach to the seat and pillows to keep them in place. Looks great on my patio. The cushions have already faded but are holding up. Other than that we love it. Just redid our deck and purchased this for it. Just had a party and everyone commented on how nice the sectional looked. Easy to put together. Only issue was the the hardware in the one package was all over the box and not in a ziplock package. Luckily I was able to locate enough of the pieces so that wasn’t an issue. Cushions were not water resistant. Stayed wet after the got wet in the rain. Took a long time to dry out. Returned. Thin cushions and frame did not appear sturdy. Nice looking sectional. The quality and fabric seem good. My only complaint are the cushions. They are not very comfortable. I'm thinking of putting in some type of memory foam topper if I can to see if that helps. The color and style is great, doesn't take to long to dry out after raining. This set is comfortable and works well with me having two dogs. The color scheme is great and I would definitely purchase again. "How many packages/ boxes will this be shipped in?" This will ship in 3 boxes. "Are the cushions sun proof?" "Did anyone elses order for this come on different days? I just received one of the 3 seaters but nothing else and the order shows completed"
Yes but I had to call customer help. "I am always worried about durability and quality. Can I have some insight here please." 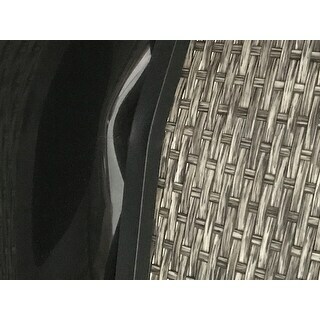 "What are the dimensions (WxL) of the sides of the sofa sections that are not cushioned? I’d like to have tempered glass pieces made to create a more sturdy table area." Love the lines, color, style. Perfect for my terrace space. Can’t wait to get it, hope quality matches aesthetic! "are the cushions machine washable?"